Tamil Nadu chief minister J Jayalalithaa is known with fervent respect as 'Puratchi Thalaivi' or revolutionary leader. The AIADMK chief turned 68 today and Tamil Nadu was draped in blood, sweat, cake, a show of money and the usual colours of sycophancy. 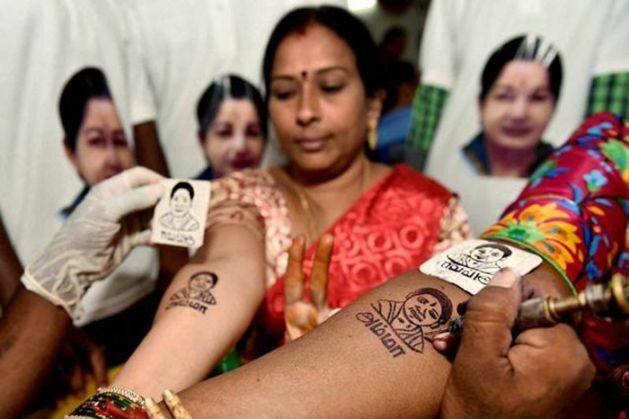 Over 1000 AIADMK party members got Amma's picture tattooed on their arms. The organisers reportedly had planned for only 668 persons, but the numbers swelled to 1,050. Of course who would resist the urge of Amma's face tattooed into their forearms with the words 'Amma everything for us' etched into their skin? 68 kilo cakes were cut in different parts of the state. And 6868 plant saplings of vilvam (bael), punnai (Alexandrian Laurel) and Magizham (ape flower tree) were planted respectively in Shaivite and Vaishnavite temples across 32 districts of the state. Also read: Jayalalithaa: what happens if a demi-goddess falls ill? Special prayers were held at 122 temples on Wednesday coinciding with Jayalalithaa's star birthday, as per Tamil almanac. Golden rings were gifted to new born babies born on Amma's birthday. And Rs 10,000 were given to their kin. 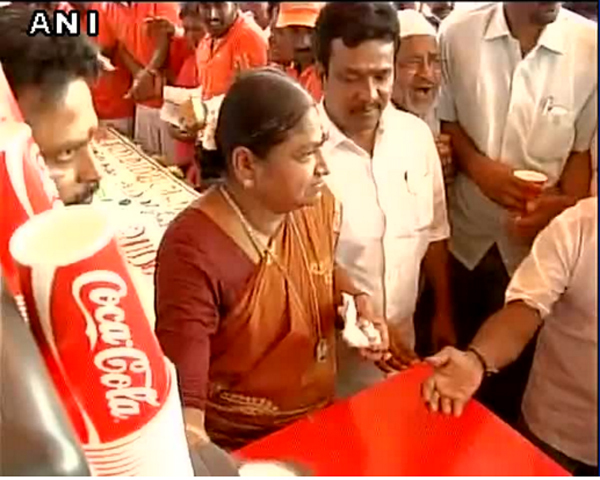 Amma canteen offered free food today and Amma products like soaps and shampoos were distributed freely to all passersby. 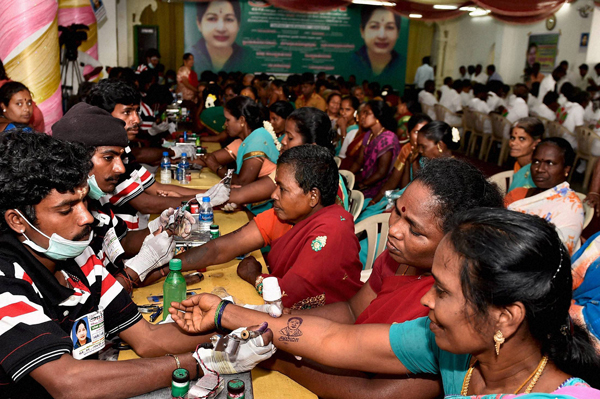 Towns and cities across the state were draped in the AIADMK colours of red and black while posters and life size cutouts of the chief minister dotted the roads. Songs from old Tamil films which featured party founder and former chief minister MG Ramachandran and Jayalalithaa also blared in the streets. Despite all this the highlight was really MLA MV Karuppaiah, who had an elaborate plan to showcase his adoration for Amma. On the eve of Amma's birthday, he got into the deep end of the government swimming poll near Gandhi Museum in Madurai and with his palms folded and arms stretched upright, he fell into the pool in a back floating namaskaram . Not just that, he even managed to hold the AIADMK flag in his mouth while remaining afloat for an entire hour. Perhaps he was aiming for 68 minutes in the pool and fell short. According to DNA, Karuppaiah said he performed the 'Jalapradakshnam' act for the well-being of 'Amma' and to convey his birthday wishes to her. 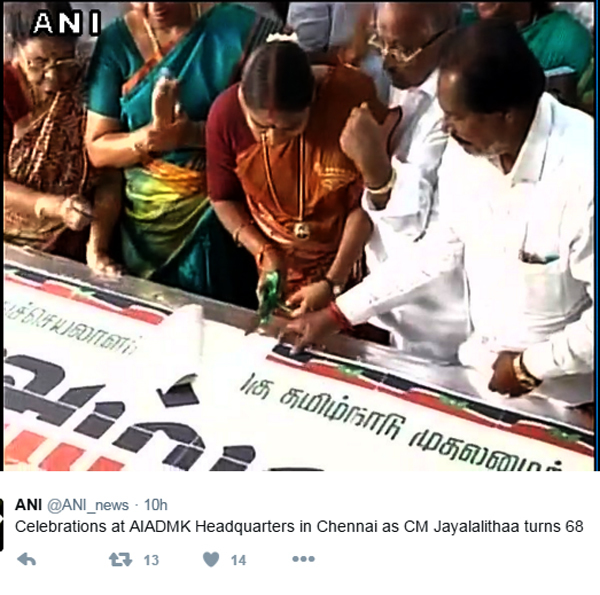 The AIADMK cadre are known for their bizzare levels of sycophancy. For her last birthday they got 67 couples married to mark the 67th birthday of their leader. Last February, an AIADMK supporter made headlines by crucifying himself to demand the leader's return as Tamil Nadu chief minister. Shihan Hussaini, a well known Karate expert in the city had nailed himself to a cross and remained on it for 67 minutes to mark Amma's 67th birthday. By that standard, this year falls marginally short in the display of sycophancy. #JatQuotaStir: here's how Haryana CM Khattar unravelled. Can he recover?